Beaufort County, South Carolina, U.S. Creating Westside Preparatory School in Chicago's Garfield Park neighborhood in 1975. Collins was born in Monroeville, Alabama, to father, Henry Knight, a businessman who owned a funeral home and worked with cattle, and to mother, Bessie Knight (née Nettles). She grew up in Atmore, Alabama, a small town near Mobile, Alabama, during the time of segregation in the American South. When she was young, Collins went to a strict elementary school in a one-room schoolhouse in Atmore, Alabama, an experience which influenced her later in life. She graduated from Clark College (now known as Clark Atlanta University) in Atlanta, Georgia. The school she started was called Westside Preparatory School. Westside Prep became an educational and commercial success. Collins created her low-cost private school specifically for the purpose of teaching low income black children whom Collins felt that the Chicago Public School System had labeled as being learning disabled. Collins said she had the data to prove that students were teachable and were able to overcome obstacles of learning via her teaching methods, which she said eliminated behavioral issues and allowed students to flourish. The one-room schoolhouse of her education influenced her methods. At home her father gave her assignments she believed built her confidence and gave her a sense of responsibility. She felt time spent with students was more valuable than distance-creating audio visual information. Collins and her daughter ran the school for more than 30 years until it closed in 2008 due to lack of sufficient enrollment and funding. Collins became well-known due to the 1981 TV movie based on her life's work entitled The Marva Collins Story, starring Cicely Tyson and Morgan Freeman. She also appeared on a featured news article on CBS's 60 Minutes. Cicely Tyson, who played Collins in the TV movie, said she spent time with Collins to research for the role. The 60 Minutes feature was inspired by a 1970s article written by Chicago Sun-Times reporter Zay N. Smith about Collins and Westside Prep. In 1982, Kevin Ross, a 23–year-old Creighton University basketball player, got to his senior year of college without being able to read. With the assistance of a Creighton booster, Ross enrolled in second grade at Westside Prep. With private tutoring by Collins, Ross learned how to read and graduated in May 1983. Ross had difficulties continuing his education, but when he had serious troubles, Collins was instrumental in helping him. Due to the success of her teaching methods, it was reported that President Ronald Reagan wanted to nominate Collins to the position of Secretary of Education, but Collins took herself out of the running for the position. In 1983, Reagan cited Collins during an unveiling of a national program to combat adult illiteracy. She was also asked by president George H. W. Bush to become Secretary of Education, but she declined in favor of teaching one student at a time. In 1994, Prince featured Collins in his music video for "The Most Beautiful Girl in the World." He also donated $500,000 to the Westside Preparatory School Teacher Training Institute, which was created to teach Collins' teaching methodology. In 1996, Collins was hired to supervise three Chicago public schools that had been placed on probation. In 2004, Collins received a National Humanities Medal, among many awards for her teaching and efforts at school reform. During the 2006–07 school year, Collins' school charged $5,500 for tuition, and parents said the school did a much better job than the Chicago public school system, which budgeted $11,300 per student. The authorities complained that this was not enough. Collins was known for applying classical education, in particular the Socratic method, modified for use in primary schools, successfully with impoverished students. Collins criticized the teaching of the students, not the students themselves. She wrote a number of manuals, books and motivational tracts describing her history and methods. In 1982 and in subsequent articles, Collins has been criticized by George N. Schmidt from Substance News, who claims that Collins' work was fraudulent. Collins denied any fraud. At the time, Collins had both supporters and detractors. Collins married Clarence Collins in September 1960. She had two sons (Patrick and Eric) and one daughter (Cynthia). Collins died on June 24, 2015 in Beaufort County, South Carolina, aged 78, while in hospice care. Collins, Marva. Too Good to Be True? 60 Minutes. New York: CBS Video, 1995. OCLC 33502110 - follow up to original 60 Minutes segment. ^ a b c Briscoe, Tony (28 June 2015). "Marva Collins, Renowned Educator, Dies at 78". Chicago Tribune. Retrieved 29 June 2015. ^ a b c Roberts, Sam (28 June 2015). "Marva Collins, Educator Who Aimed High for Poor, Black Students, Dies at 78". The New York Times. Retrieved 29 June 2015. ^ Kellett, Susie (11 December 1978). "For the Kids' Sake, Marva Collins Resurrects the One-Room School House—in a Chicago Ghetto". People (Vol. 10, No. 24). Retrieved 30 June 2015. ^ Matthews, Michelle (29 June 2015). "1 comment Acclaimed educator Marva Collins, a native of Monroeville, dies at 78". AL.com. Alabama Media Group. Retrieved 30 June 2015. ^ Cite error: The named reference People-One Room Schoolhouse-1978 was invoked but never defined (see the help page). ^ Cite error: The named reference WLS-TV-Chicago-ABC-School Closure-2008 was invoked but never defined (see the help page). ^ a b "Marva Collins - Biography" (PDF). Marva Collins. 2011. Archived from the original (PDF) on 23 July 2011. Retrieved 29 June 2015. ^ Collins, Marva. "Excerpts from Ordinary Children, Extraordinary Teachers and Marva Collins' Way". EDOCERE. Society of Saint Pius X. Archived from the original on 5 February 2005. Retrieved 29 June 2015. ^ "Marva Collins Biography". Biography.com. A&E Television Networks. Retrieved 7 June 2016. ^ a b c Jordan, Karen (5 June 2008). "Marva Collins School to Close". WLS-TV Chicago. Retrieved 29 June 2015. ^ O'Connor, John J. (1 December 1981). "TV: Marva Collins, Unusual Teacher". The New York Times. Retrieved 30 June 2015. ^ Fraser, C. Gerald (29 November 1981). "Television Week: Dedication". The New York Times. Retrieved 30 June 2015. ^ Dudek, Mitch (25 June 2015). "Marva Collins, 'a natural force' in inner city education, dies at 78". Chicago Sun-Times. Archived from the original on 1 July 2015. Retrieved 30 June 2015. ^ Lassiter, Jim (9 June 1983). "For Kevin Ross, There Is More to Learn". The Oklahoman. Retrieved 30 June 2015. ^ Ley, Bob; Salters, Lisa (17 March 2002). "Outside the Lines: Unable To Read". ESPN. Retrieved 30 June 2015. ^ Curry, Jack (30 January 1990). "Suing for 2d Chance To Start Over". The New York Times. Retrieved 30 June 2015. ^ Wattley, Philip (24 July 1987). "Cops Subdue Ex-basketball Player Kevin Ross In Hotel Rampage". Chicago Tribune. Retrieved 30 June 2015. ^ Smith, Hedrick (18 December 1980). "Chicago Principal Weighed for Cabinet" (PDF). The New York Times. Retrieved 30 June 2015. ^ Associated Press (21 December 1980). "Elizabeth Dole Is Appointed Liaison Assistant by Reagan". Reading Eagle. Retrieved 30 June 2015. ^ Hunter, Marjorie (21 December 1980). "Mrs. Dole is Named Assistant to Reagan" (PDF). The New York Times. United Press International. Retrieved 30 June 2015. ^ UPI (8 September 1983). "Reagan Backs Literacy Effort". The New York Times. Retrieved 30 June 2015. ^ "The Columbia Guide to African American History Since 1939". ^ "Prince Donates $500,000 to Marva Collins' School". Jet. 4 November 1985. Retrieved 30 June 2015. ^ "This Famous Alpha Kappa Alpha Soror Was Featured In Prince's Video". Watch The Yard. May 31, 2016. ^ a b Johnson, Janis (2004). 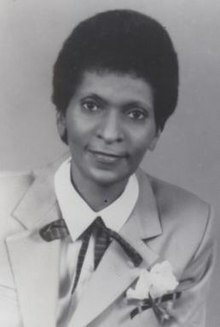 "Awards & Honors: 2004 National Humanities Medalist - Marva Collins". National Endowment for the Humanities. Retrieved 29 June 2015. ^ Associated Press (2 September 2008). "Chicago Students Skip School in Funding Protest". NBC News. Associated Press. Retrieved 29 June 2015. ^ "The Muckrakers". Education Week Teacher. 1 August 1994. Retrieved 30 June 2015. ^ Smothers, David (7 April 1982). "Controversial Teacher Marvis Collins: Educational Wonder Woman or Fraud?". Schenectady Gazette. UPI. Retrieved 30 June 2015. ^ "'Superteacher' in Chicago Under Fire From Parents and Press". The New York Times. 7 March 1982. Retrieved 30 June 2015. ^ DeVries, Hilary (9 September 1982). "Dedicated to Education as Ever, Marva Collins Still Rocks Boat". The Christian Science Monitor. Retrieved 30 June 2015. ^ "National Winners Greatest Public Service Benefiting the Disadvantaged". Jefferson Awards for Public Service. 1981. Archived from the original on 24 November 2010. Retrieved 29 June 2015. ^ "Soror Marva Collins". aka1908.com. Retrieved 26 June 2015. This page was last edited on 8 February 2019, at 18:44 (UTC).